← Was Sarah Palin Thinking: “I’ll Always Love You, Charley”? 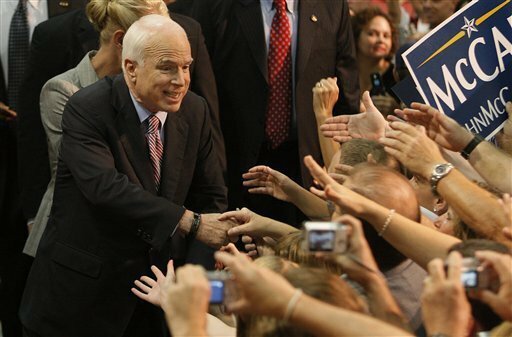 Is McCain Now “The Sort of Politician He Once Despised”? It was not McCain’s accessibility that made him so attractive to Cohen. Rather, as Cohen wrote, it was the effect McCain had on his audiences, particularly young people. “He expressed his message in words, but he packaged it in the McCain story — that man, beaten to a pulp, who chose honor over freedom. This had nothing to do with access. It had to do with integrity”. McCain has soiled all that. His opportunistic and irresponsible choice of Sarah Palin as his political heir — the person in whose hands he would leave the country — is a form of personal treason, a betrayal of all he once stood for. Palin, no matter what her other attributes, is shockingly unprepared to become president. McCain knows that. He means to win, which is all right; he means to win at all costs, which is not. . . . .
Recalling an earlier encounter with the McCain he once admired, Cohen recalls what he describes as an “extraordinary” moment following the 2000 South Carolina primary. McCain confessed he had lied when he supported the flying of the Confederate flag. McCain admitted he actually abhorred the current use of a symbol so offensive to African Americans. He admitted he broke his promise to always tell the truth. The turning point for Cohen, which he terms “the precise moment of McCain’s abasement”, came when McCain walked onto the set of the daytime television show, The View, no doubt expecting a pleasant chat with a panel of women, including the program’s creator, Barbara Walters. McCain didn’t just pick a politician who could appeal to Wal-Mart Moms. He picked a Wal-Mart Mom. Indeed, he picked someone who, in 1999, as Wasilla mayor, presided over a wedding of two Wal-Mart associates at the local Wal-Mart. “It was so sweet,” said Palin, according to The Anchorage Daily News. “It was so Wasilla.” A Wasilla Wal-Mart Mom a heartbeat away? I suspect most voters will say, No problem. And some — perhaps a decisive number — will say, It’s about time. It is also “about time” for George Will, the dean of the political right media, who appeared on ABC’s This Week program and defended Palin’s performance during her encounter with ABC’s Charles Gibson. Will, who is usually the first to pounce at the first sign of flawed knowledge, criticized the professorial manner Gibson used in asking Sarah Palin if she supported “the Bush doctrine”. Palin had hedged her answer, clearly unaware of the Bush Doctrine. Gibson finally described the doctrine to her. Will apologized for her fumbling responses by saying he could not have answered that question himself. A remarkable comment for the well-read Will, which suggests that either he has suffered a severe loss of memory or else, like McCain, he is willing to evade the truth to defend Palin.